Certain albums need help in order to work better. In theory, it’s simply a case of buying a record/downloading an album/sticking on a CD and listening to your music. And for most albums, that’s exactly how the transaction works. But not 1.Outside. Released in the 90s, years after last having any substantial hit songs in the charts, Bowie offered up an album so ambitious that it shot over the heads of casual listeners. Aided by Brian Eno, who hadn’t worked with Bowie since Lodger (another underrated Bowie album), they joined forces with Bowie’s band to work on – depending on your perspective – a conceptual masterpiece or an overstuffed or incomprehensible mess. For the purpose of this blog, I vote we go with ‘conceptual masterpiece’, or at least ‘brave attempt’. Regardless of my thoughts on the matter, not even I would advise my readers (that’s you, you, you and YOU over there) to stick 1.Outside on whilst driving or hoovering the living room. Certain albums really do need a bit of help in order to work better, and with this album, you’d benefit from a set of headphones and a dark room. They really make a difference, for 1.Outside is a ‘listen while you’re in bed’ record. Anyone expecting Let’s Dance or Blue Jean would instead come up against a sci-fi novel set to music, because that’s what 1.Outside is: a novel told in sound and song, each track working as a chapter, each chapter making up the narrative. Eerie snatches of dialogue are interspersed between tracks; what could come across as intrusive ends up being utterly captivating, if only because Bowie gets to display his talent as a mimic and voice artist. 1.Outside tells the tale of Nathan Adler’s investigation into art murders in a future dystopia. Aren’t most fictional futures dystopic these days? Actually, the present is pretty dystopic too. Not even Bowie could conceive of America with a giant wall around it. I first heard this album when I got a copy of it out of my local library. The case was cracked but the cover art drew me towards it. I knew of Bowie, of course. My mum’s boyfriend had his greatest hits. Yes, I expected Let’s Dance and Blue Jean. And yes, I came up against a sci-fi novel set to music. But as I listened to this album, sometimes struggling against it, I always knew it was something of substance and quality. The inside notebook was a novel itself. Raised on Jeff Noon and Doctor Who New Adventures, the apparent complexity of Bowie’s vision didn’t faze me. The concepts were interesting enough, the music veering from hard rock to industrial with jazzy piano songs in between made sure my attention was always kept on something. For me, this Bowie is just as important as Ziggy Stardust or Jareth The Goblin King. Not every song needs to be accessible to have an effect on the listener; sometimes it’s good to give listeners what they don’t expect. My first attempt at listening to this album was met with failure. I just stuck on a Smashing Pumpkins album instead. Or Nine Inch Nails. But I couldn’t give up. I felt like 1.Outside was worth persevering. The Motel reveals itself with each listen, melody slowly appearing like a clue at a crime scene. Outside is a sonorous funeral march to places too terrifying to contemplate. Catchy though. I Have Not Been To Oxford Town is oddly groovy. I haven’t been to Oxford, funnily enough. Hallo Spaceboy is pure Bowie, pure alienation for your radio station. I prefer The Pet Shop Boys version; they understood Bowie and knew a thing or two about pop and art. The Heart’s Filthy Lesson is a highlight of 1.Outside, though it probably works better when listened to as part of the album. It ranks as one of my favourite Bowie singles, actually. The Trent Reznor Remix is brilliant. In the end, this is a book…well, an album in chapters…that was meant to have a follow-up. 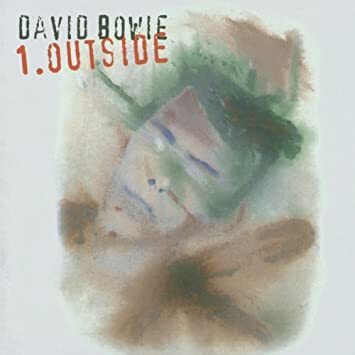 Brian Eno apparently stated Bowie’s intention to create 2.Outside, but even more interestingly was the statement Brian made about Bowie’s pride in this album. I’m glad. I don’t need the artist to approve their own work or give me permission to value it, but it’s good to know Bowie rated an album that is virtually defined by the term ‘underrated’. I prefer ‘underrated’ to ‘overstuffed’ or ‘incomprehensible mess’. ‘Weird’, ‘atmospheric’, and ‘intriguing’ work just as well. Go get your headphones, blot out the light, let yourself experience Bowie’s weird vision…and find your own words to describe 1.Outside. It’s worth the effort.